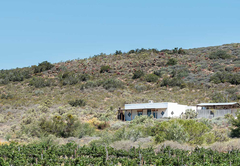 Tanagra Wine and Guest Farm is a highly recommended property providing self catering in McGregor for tourists visiting the Breede River Valley region. 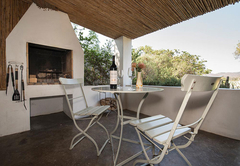 Tanagra is an idyllic wine and guest farm with character in the McGregor Valley providing a stylish and yet authentic countryside experience in tastefully furnished accommodation for the wine and nature lover. 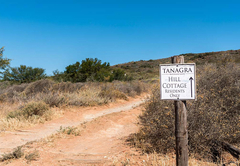 Tanagra is a wine farm surrounded by vineyards, indigenous fynbos and mountains. 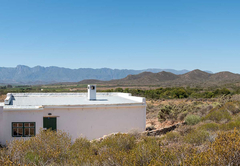 It is located 4.5 km outside McGregor and adjoins the Vrolijkheid Nature Reserve. 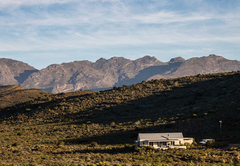 Most parts of the farm are accessible by various walking / hiking trails (also great for mountain-biking), which can easily be extended into the neighbouring Vrolikjkheid Nature Reserve. It is a great place for bird-watching (172 species have recently been specified). The quaint 19thc village of McGregor is located just 5 km further up the road (which ends there!) and is a great spot to experience country hospitality at its best. 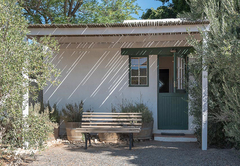 Tanagra offers six units, three cottages (Garden Cottage, Hill Cottage, Faraway), two apartments (Bottlebrush and Gumtree) and the Loft studio. 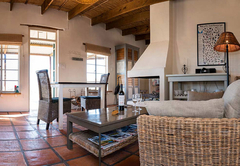 Most units are located around the old historic Tanagra homestead and the boutique wine cellar. 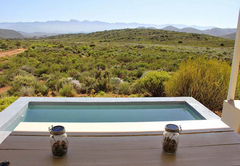 The Hill Cottage sits in the midst of fynbos overlooking the vineyards with spectacular views into the McGregor valley. 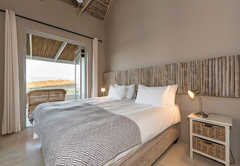 Faraway is a new addition to the farm cottages, an eco and architect’s house located at the most solitary spot on the farm – just fynbos and mountains and silence. 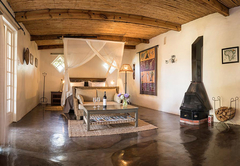 All units have their own unique character, are tastefully furnished with the intention to provide a naturally elegant farm ambience (see eg stone structures, reed ceilings, carefully chosen equipment) and boast scenic views on mountains and / or dam. 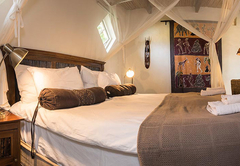 Please note that most units sleep two adults (exceptions possible for Loft studio, the Garden Cottage and Gumtree Apartment on request); Faraway has two en-suite bedrooms and sleeps four persons (extra beds possible for children). 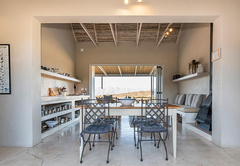 Units are let on a self-catering basis. For those who like to eat out, there are some lovely restaurants in McGregor, only a 5 minutes' drive away from us. 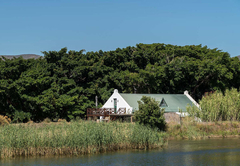 The little restaurant at the Donkey Sanctuary, just across the road from Tanagra (in walking distance) is open Thursday from Sunday from 10h00 to 16h00. 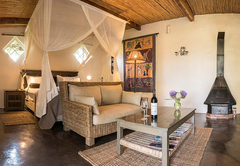 Spacious and tastefully furnished one-bedroom cottage (sleeping two adults) situated close to the swimming pool while still providing privacy. 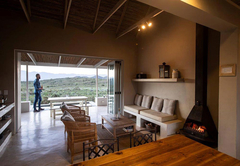 Fully equipped separate kitchenette (gas hot plates), en-suite bathroom (toilet and shower), fireplace (indoors) and large private and covered verandah with inbuilt fireplace/braai and scenic views right onto Vrolijkheid Nature Reserve. 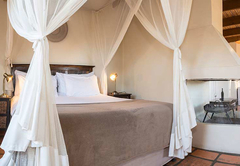 Two charming, spacious and tastefully furnished one-bedroom apartments (sleeping two adults each) as part of the large guest wing attached to the old Tanagra homestead. Wooden floor and high vault reed ceilings make these apartments light and airy. 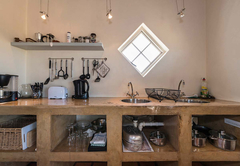 The kitchens are fully equipped (gas hot plates). Fireplaces (indoors). 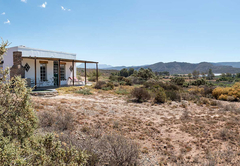 Private entrance and a private (and covered) verandah with scenic views on the mountains. 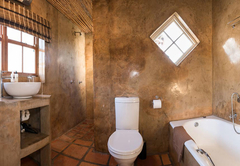 En-suite bathrooms with electrical plugs (toilet, walk-in shower and bath in Bottlebrush; toilet and shower in Gumtree). 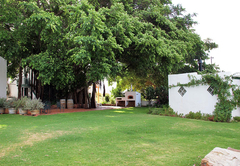 Private braai places at the cottage (in the garden). 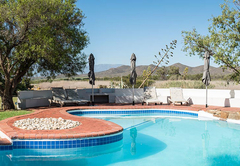 Very spacious studio above the old Tanagra winery with adjoining large wooden and sunny deck providing scenic views over the mountains and the beautiful farm dam. 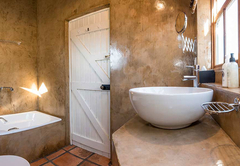 En-suite bathroom (toilet and shower). Fully equipped kitchenette. Indoor fireplace. 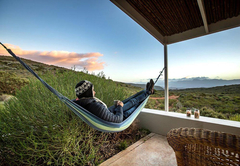 Private outdoor braai and hammock close to the dam. 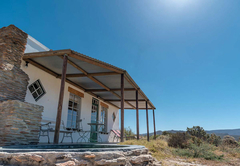 Private and romantic cosy cottage set amidst indigenous fynbos and overlooking the Tanagra vineyards with breathtaking views over the McGregor valley. 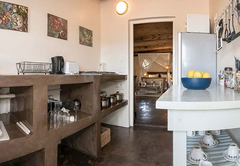 Fully equipped one-bedroom cottage with large kitchenette area, open fireplace, en-suite bathroom (toilet, walk-in shower and bath). 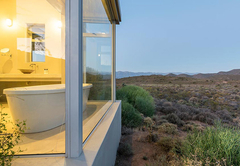 Private plunge pool with scenic views in valley. Large shaded verandah with fireplace / braai. 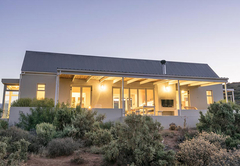 Most secluded of all cottages, this is a two bedroom architect's house (both bedrooms with en-suite bathrooms), built in the style of a Cape Dutch Langhuis in a conserved area of Karoo veld and fynbos and run on solar and wind energy. 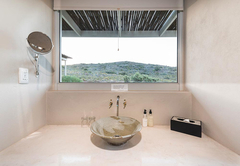 Large panorama windows allow an unobstructed view into the pristine landscape from wherever you are in the cottage. Separate lounge / kitchenette (fully equipped) with open fireplace. 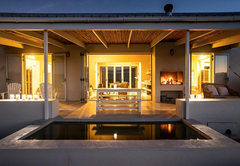 Two spacious and shaded verandahs in front and back of the house with attached plunge pool and spectacular views on the mountains and into the Robertson valley. 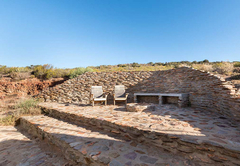 Two braai (barbecue) areas outside. 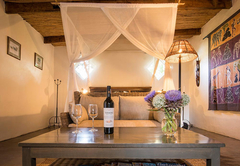 Your hosts Anette and Robert will give you a warm and personal welcome and gladly show you the farm and introduce you to the Tanagra wines and grappas in private tastings (see also ‘wine and grappa experience at Tanagra’ below). 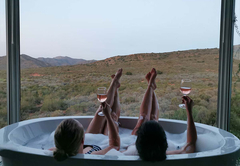 Guests have the choice between keeping privately to themselves (all units secure your privacy) or joining each other in the garden (and winery). The units are fully serviced every third day (linen change every 6 days). English and German spoken. Please note that we deliberately did not equip the rooms with TV to stress the peaceful and private character of your countryside escape. (Rugby or cricket matches can be watched with the locals at the Old Post Office Pub in McGregor). Tanagra is a boutique wine cellar producing hand-crafted distinctive wines (mainly noble red wines) maturing in French oak. A boutique distillery has been at work since December 2009, producing top-range European style Grappas and Eau de Vies. 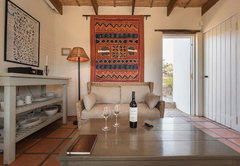 You are welcome to explore the vineyards and get personally introduced to the cellar and the Tanagra wines by the owners and your hosts Anette and Robert. 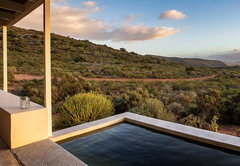 Faraway is built on the most solitary spot of the farm and just fynbos, mountains, endless skies, and silence. 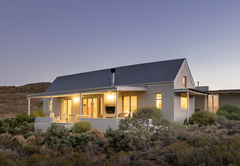 It combines the traditional features of a Cape Langhuis with an eco-friendly (off the grid) and modern design (large panorama windows & doors). 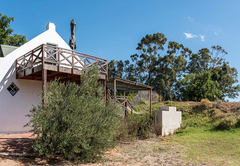 Romantic and private one bedroom cottage, sitting alone on a hill, surrounded by indigenous fynbos and overlooking the Tanagra vineyards with breathtaking views into the McGregor and Robertson valley. 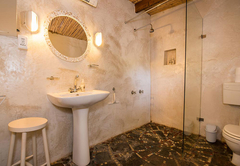 This spacious one bedroom studio is located above the Tanagra winery (81sqm in size, incl. considerable roof slope). 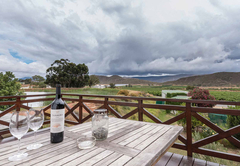 The highlight is a spacious and sunny wooden deck providing scenic views on the mountains, the beautiful farm dam and the vineyards. 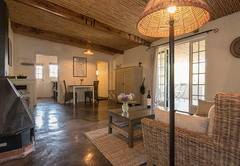 Spacious one bedroom cosy country cottage (47sqm), with coloured screed floor and reed ceiling, located in the garden next to the pool while still providing privacy. Sheltered stoep looking out on nature reserve. Charming and spacious one-bedroom apartment attached to the old Tanagra homestead. Wooden floors and high vault reed ceilings keep this apartment light and airy. 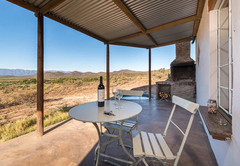 Braai place in the garden and lovely views on the mountains. Gumtree is a charming and spacious one-bedroom apartment attached to the old Tanagra homestead. Wooden floors and high vault reed ceilings keep this apartment light and airy. 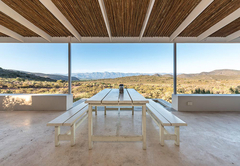 Braai place in the garden and lovely views on the mountains. We thoroughly enjoyed our stay at Tanagra. 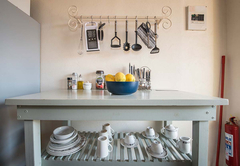 The room was comfortable, the kitchen provided you with everything you needed for self catering. The hosts, Anette and Robert were welcoming and friendly, providing lots of information of the various places to visit, or hikes to go on. We aren't wine drinkers, but nature lovers, so there was lots to do and enjoy. We will come back to stay. Response timeTanagra Wine and Guest Farm typically responds to requests in 5-10 minutes. Child policyChildren of all ages are welcome under adult supervision, parents to note the unfenced swimming pool.